Is it just me, or has the demand for home baked goodies decreased? The bake sale used to be the classic fundraiser, but now most groups sell candy bars, wrapping paper, popcorn or magazine subscriptions. In school settings, there’s always the issue of allergies. Or is it just that people don’t bake anymore? Still, there are a few occasions that call for a home baked donation. I belong to a community chorus that holds a couple of bake sales a year (usually during intermission or after a concert), so I try to do my part. But baking time also comes at the same time as extra rehearsals, so I’ve got a new strategy. I want my goodies to be as fresh as possible, but I don’t want to be piping elaborate decorations at 4 a.m. the day of the concert. Delicious, easy to transport, not too time or labor intensive. Really, aren’t those requirements for everything in life? 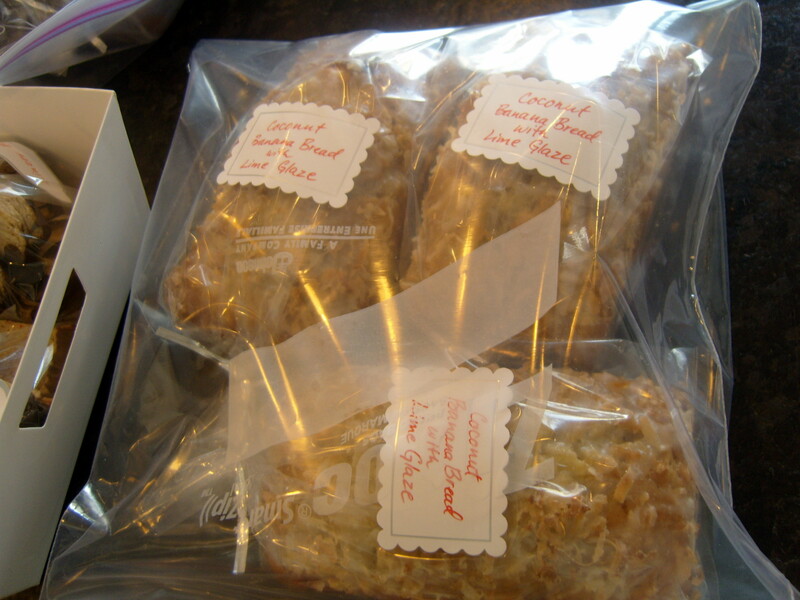 My favorite bake sale recipes are small loaves of banana bread (Coconut Banana Bread with Lime Glaze, or Chocolate Swirl Banana Bread), scones, and olive oil granola. 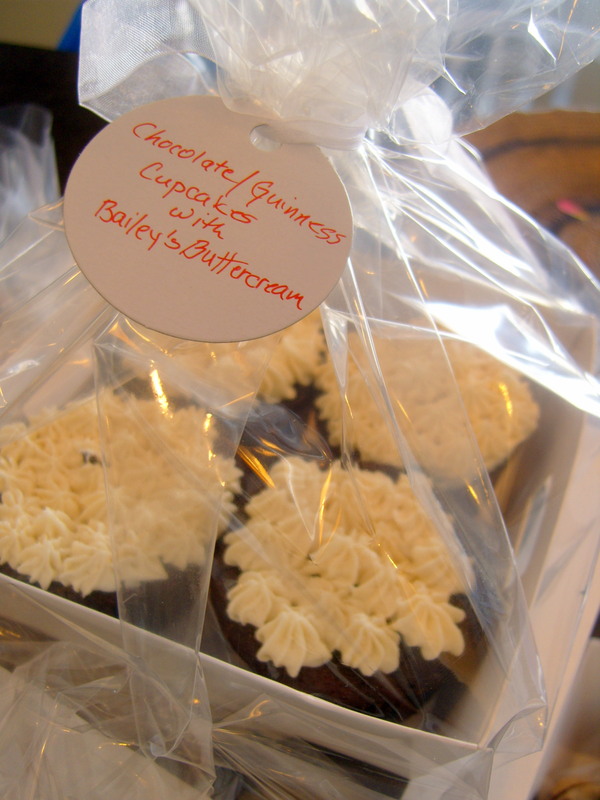 I’ve baked cupcakes before, which were a big hit, but they are labor intensive, the ingredients can get pricey, and you really need to buy special boxes. If I had the time, I’d make them again (fancy cupcakes fetch a good price! )–but I usually don’t have the time. 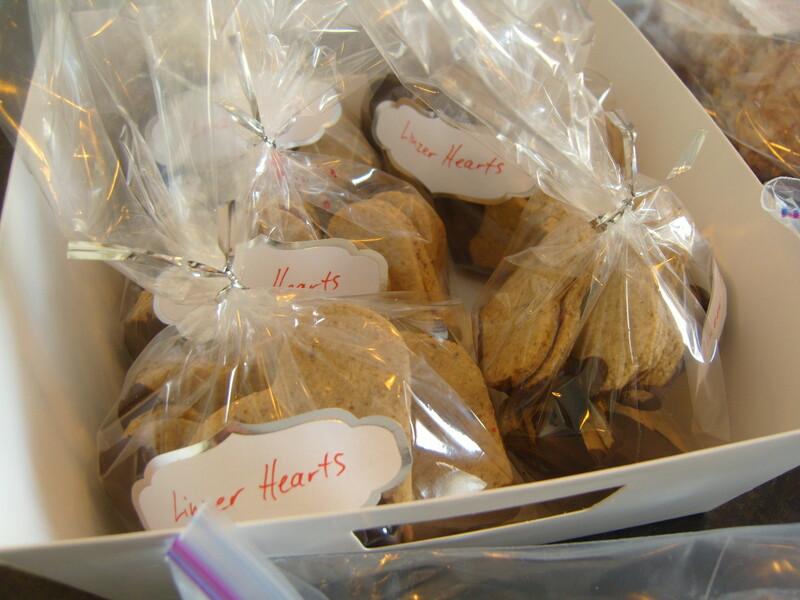 In real estate they say, “Location, location, location!” In sales, it has to be, “Packaging, packaging, packaging!” Seriously, if you’re asking people to shell out $3 for six cookies, they’d better look pretty and not be sliding around on a paper plate under some wrinkled plastic wrap. I always buy these clear treat bags with silver twist ties at my local craft store (and always with a 40% off coupon!). I get a pack of 50 for under $3. They are the perfect size for a stack of half a dozen cookies or brownies, two cups of granola, or a little loaf of bread. Label your items in your nicest handwriting (I usually use white mailing labels and a colorful pen, or sometimes pretty labels that I bought with yet another coupon). If I have to bake bread even a couple days ahead, I package everything up and then seal it again in a ziplock freezer bag. Store it in the freezer until the morning of the bake sale. Be sure it has sufficient time to thaw. Nobody wants to buy half-frozen baked goods. I don’t like to freeze baked cookies (for home, sure–to sell, no), but I will often mix the dough up to a week ahead and flash freeze the scooped cookies. Then I only have to bake the cookies the night before the sale. I want to go to your bakesale. I haven’t necessarilly noticed fewer,just lower quality…so what you said about packaging is key!! 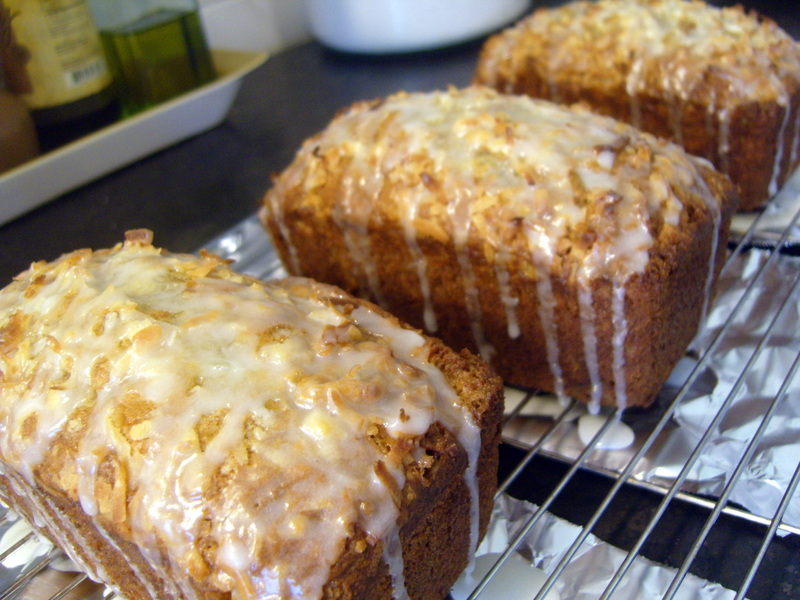 I think the recipe for banana coconut bread with lime glaze is getting baked this weekend. yahoo! !